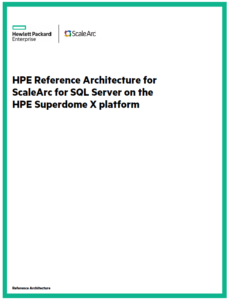 Heraflux is proud to have contributed an industry perspective to a recent whitepaper highlighting scale-up architectures using HPE’s Superdome X and ScaleArc. Sometimes database-specific workloads do not scale out well because of years of legacy design and engineering, and in those occasions you need to scale up. Scaling up a business-critical applications, just like scaling them outwards, is not a trivial task. Leveraging modern scale-up technologies such as the HPE Superdome X servers and ScaleArc’s database acceleration and availability solution can help you scale your applications up without dramatic and costly modifications to your code. Check out this reference architecture for Superdome X and ScaleArc here! 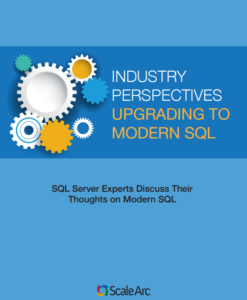 Recently David Klee contributed his thoughts in a new ebook from ScaleArc called “Industry Perspectives: Upgrading to Modern SQL“. Modernizing the datacenter is an ongoing struggle for those of us in the operational trenches, and a number of us in the industry contributed our thoughts to ScaleArc to help administrators sift through the options and learn how to make these upgrades easier. It’s a great read, and learning from the great contributors is fun! Check it out! Heraflux is pleased to announce a new collaborative whitepaper with ScaleArc entitled “Improving uptime and performance of legacy apps on Microsoft SQL Server“. Performance tuning inefficient legacy applications can be a tremendous drain on development resources in an organization. Handling availability of the database layer of these applications can be an even larger challenge. ScaleArc can help improve both challenges by improving the availability of the database layer and accelerating common repetitive database queries from the application. The past five years or so has seen a shift in people’s expectations for application performance. As they’ve seen their personal apps deliver continuous uptime and high performance, they’ve grown more frustrated with the slower performers in business. Despite these business apps being critical to corporate performance, users have “just dealt with it” for years whenever they’re slow and unreliable. One challenge, of course, has been that these enterprise apps are much more complex than the personal apps, making it harder to update them. Plus, making the necessary changes to “update” the application might be out of the hands of an organization when they don’t control the source code, or are costly and time prohibitive to update when they do. A compelling alternative has emerged. Rather than recoding apps for improved uptime and performance in a database environment, consider the benefits of database load balancing software. A pioneer in this technology, ScaleArc has set out to make business application platforms more highly available and perform better by managing the traffic into the database servers. The ScaleArc software acts as an intermediary between the application and database layers. Sitting in between, it buffers database outages from impacting application availability and transparently accelerates the application’s performance, all without code or usability changes. This whitepaper explains the benefits of the ScaleArc software and shows benchmarking results of one feature set – app-transparent caching. In our tests, the ScaleArc software enabled a 5x improvement in the operations processed per minute and a drop in CPU consumption from a peak of 100% to a peak of 60%. Download this new whitepaper today!